Look out for the warning signs… and don’t get scammed! Most teachers won’t come across TEFL‏‎ scams through their entire career, but just in case you are thinking that something doesn’t sound quite right, this page deals with what you should be aware of out there and what you should avoid, and finally what you can do if it all goes wrong. In general, TEFL scams fall into three main categories. Scams to persuade you to take a particular TEFL course. Scams where you pay someone to find you a job. Scams involving the school where you work. Finally there are occasionally scams of a more general nature involving identity theft and so on. These are also dealt with below. There are good TEFL course providers and bad TEFL course providers and all kinds in between. The level of scams here tend to be about the value and reputation of a particular TEFL certificate and/or course. There are two things to remember here. There is NO international, independent accreditation organisation operating for TEFL certificates. If a company says their course is internationally, independently accredited they are lying. No certificate can be guaranteed to be accepted everywhere regardless of what anyone says. Some TEFL course providers offer “guaranteed” work when you finish the course (often with a money back guarantee). These should be viewed with a healthy dose of scepticism. To be able to find work for even the worst teachers, a TEFL provider may well place teachers with any old rubbish school out there just to fulfil their end of the bargain. If a TEFL provider say they are accredited by XYZ Accreditation (or whoever) make sure you check out the validity of that accreditation. It won’t be international, but it might be national. Does the agency accredit only TEFL courses or do they accredit everything under the sun? Are they government run or not? It’s difficult to generalise about accreditation agencies, but a good start to find out how good they are is to do a search on the TEFL forums to see what kind of reputation they have. There is, for example, one agency name often quoted as being international and independent which is in reality nothing more than a front for a school and completely the opposite of what they claim. This information is readily available if you read the forums and search online! While researching companies online you may find yourself reading through one of the several TEFL Course Review sites out there. Please note that it has recently come to our attention that one of the major review sites was actually set up by a TEFL provider to (primarily) put up good reviews about their courses! See also, Fake TEFL Certificates‏‎. A few simple rules here will keep you safe. There are lots of genuine jobs out there, but occasionally you will come across scams. 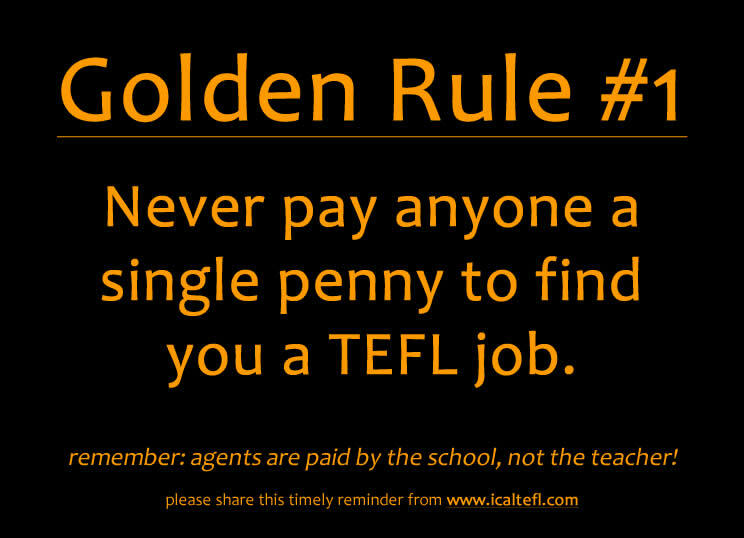 There is, in effect, just one golden rule when it comes to finding work teaching English. …to cover the costs of organizing your visa or paperwork The school should always pay for this upfront; they may later deduct certain payments from your first month’s salary but they should never ask you to pay for the cost of organizing your visa before you have started work there. Note that if you get your visa yourself from the local embassy you may have to pay this cost yourself which is fine. …to pay for an agent to find you a job. Never pay an agent to find you work. They get paid by the school they supply to, not the teacher they supply so if an agent says you must pay them to find you a job, walk away and find another agent. …to register your TEFL/TESOL CV/Résumé on a website. Sites like this are almost always a waste of time and the jobs often non-existent or out of date. …to perform some special check or organize a specific local paper to find work. Scams like this run along the lines of, “I’ll pay you 10,000 per month but you need to send me 500 now to get a work permit.” Walk away. …some schools will insist on you using a certain travel agent for you to use to fly over; make sure you’re not paying well over the odds for the ticket here and if the travel agent will also organize your visa, be very careful! This can’t be said loud enough: DON’T PAY A SINGLE PENNY TO FIND A JOB! You can find work for nothing by looking online or talking to a reputable agent. If you pay someone for help in this area, chances are you will never see your money again and the job is likely to disappear. Also, when you first start looking for a job you should check out all the agencies and job adverts regularly to build up a good picture of a “typical” job in the country of your choice. This is simply good practice because occasionally you will come across an advert for a job which suddenly pays a lot more than the average job. This should set alarm bells ringing! In terms of jobs, if it looks too good to be true, it probably is. Secondly, a school should always give you full contact details. If they don’t include a physical address and a land line then be careful. Go onto Google maps and look for the school address there. It probably exists but in occasional cases it may not. If you can, check the photos and see if you can see the actual building. Then check the school email address and be wary of those working under a Hotmail or other free account. The domain of the school website should be explicit. Another good idea is to check the school phone number and then call it up. There are occasional reports of scammers using the name of a genuine school to advertise work online and then ask for a visa processing fee from the teacher. One suspicious teacher simply called the school to discuss this fee and was told by the school that no job existed and the advert was phoney! There are several reliable and genuine government sponsored work programs for teachers. One typical example is the MoE – Spain‏‎ program which takes North American students and finds work for them in Spain‏. Others include JET in Japan and EPIK.in South Korea. All these programs are free. However, some scam agents are charging teachers to prepare their paperwork and suchlike. If you enroll in a program to find work, make sure you go through the official channels only and not an agent! On this point, be very careful about paying money to “volunteer” somewhere teaching English. These are often (although not always) little more than you paying for the privilege of working with no benefit to anyone. For more on this, see Volunteering‏‎. These are often more difficult to spot and to deal with. Scams in this area are not common, but do occasionally happen. One here is the school not properly paying your tax or health insurance‏‎ but still deducting the full amount from you. If you suspect this is happening firstly go back to your contract‏‎ to find out exactly what was promised before you accepted the job.Then check with other teachers in your school or other schools in the area to find out their situation and get their advice. As soon as you have done this, approach your DoS‏‎ and find out what is going on. Perhaps it was a genuine oversight on their part, but you need to expressly let them know that you know what is going on. If all else fails, tell the management that you will contact the local tax office to clarify the situation. Tell you boss this nicely! Just explain that they may be able to help you both out. Chances are that your boss will be more afraid of the tax office and make immediate amends. In China when you complete a contract you will be given a Release Letter. This allows you to work freely in other schools. Some schools in China will charge a teacher for the letter. For more on this, see Release Letter (China). If you are looking for work in a school you should always check online to see what others say. A simple online search for “schoolname scam” may bring up some interesting results. Remember, however, that negative comments on forums may be merely from disgruntled former teachers or rivals and high praise comments could come from the school owner themself. On forums, take an overview of what is said and see who is saying it. A person who joins a forum and posts 3 super positive comments about a school is probably working for that school – check for more balanced posts if you can. In the industry there are several schools well known for adopting different identities and posting online in forums as “independent” former students saying how brilliant the school is. Watch for these! If you are concerned about the possibility of general identity theft, there are several steps you can take to minimise this. Never send original paperwork to anyone (e.g. your passport or any certificates). Instead, always send a copy and feel free to pixelate out any information you don’t feel comfortable sending (such as your address or the barcode of your passport). However, sending your passport number is fine as this may be required for visa purposes. When you do send copies of your documents, have printed across them “For application purposes only” or something like this. Feel free to give the month and year of birth, be circumspect about giving the day also. Never send your social security number. If you feel more secure, get a PO Box to receive mail so that you do not give away your home address. Chances are that throughout your entire TEFL career you will never be ripped off or scammed. However, if it does happen all is not lost. First, before panicking, contact the relevant person quickly and in writing to ask for clarification. Don’t get abusive and don’t make threats or demands. Make your questions simple and clear and ask what the situation is. If you have paid money for a course which didn’t arrive or sent money for visa processing and heard nothing more, just ask to begin with. It may genuinely be an oversight so always give the person at the other end a chance to clarify. At this stage keep things formal, but firm. If the relevant person isn’t helpful, try to email (always in writing so you have a written record) someone higher up the food chain. If that doesn’t work, then you can tell them your course of action. I would like a full refund of my money. If this is not possible within 7 days I will be forced to cancel my credit card and claim a full refund in this way. Notice that you should always give the company a chance to refund the money themselves. The reason is simple: it’s less hassle for you. However, if this does not happen, simply approach your bank and ask them to cancel the relevant credit card payment. Remember, credit card payments can usually be cancelled within 60 days of the transaction taking place.